A few weekends ago I hosted a beautiful baby shower for a dear friend. She is the cutest preggo ever and very hip + stylish. 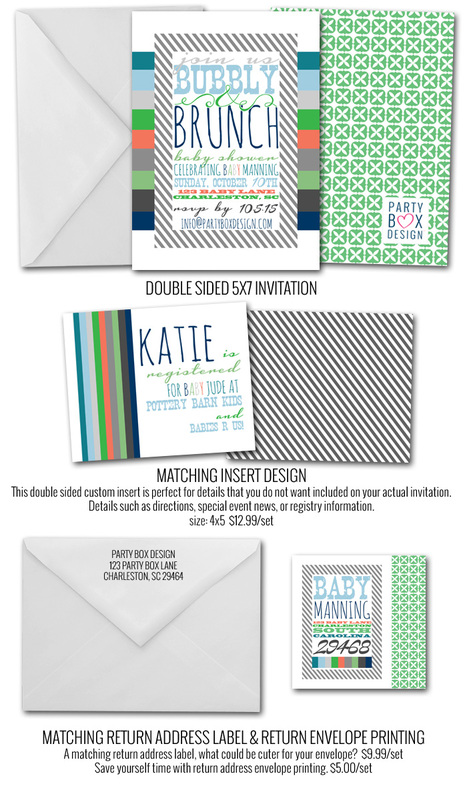 I decided to go with a modern vibe, using the colors from her nursery for the baby shower invites! These invites might be my most favorite baby shower invitations ever! Now, I am a busy mom + small biz owner so having a plan of action is important. To save time + stress, I started planning early. I designed + printed the champagne labels, drink flags and water bottle labels well in advance. I also designed the favor bag toppers, that were so cute I used them as place cards. All the party decor was just coming together so nicely. 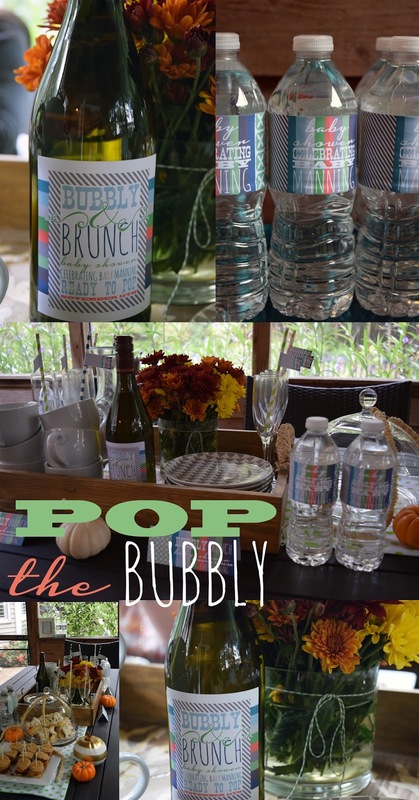 I wanted to host a baby shower that everyone enjoyed, nothing traditional... a bubbly brunch is what I came up with, and that's exactly what it was. A beautiful late morning, crisp Fall air with amazing food and champs. A morning shared with friends, celebrating Katie and her Baby! The food was on point, I made it all and impressed myself. I scoured pinterest for months before the shower, fine tuning exactly what I wanted and felt I had time to prepare with precision. The menu was creative and modern, sweet, spicy and salty. Everything a preggo would hope for. I literally made BACON JAM... yes, you read that right and OH MY GOSH was it unreal. This is the recipe I used, however did add more brown sugar. I placed the bacon jam on mini chicken and waffle sandwiches... mouthwatering. 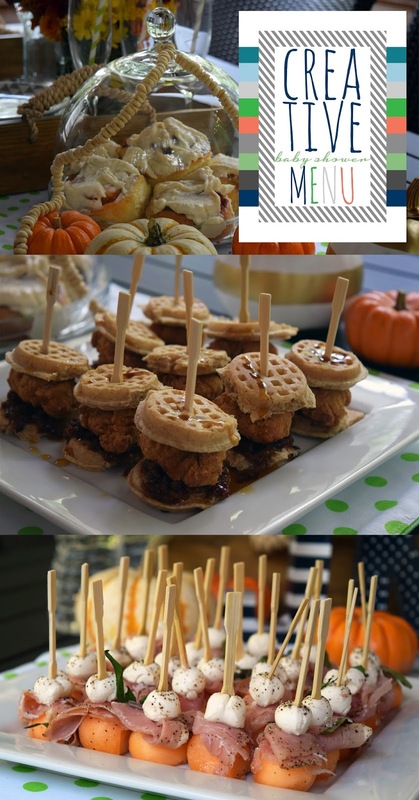 I also made some other fun little apps, along with the most delicious egg boats and cinnamon buns with cream cheese icing. Arguably, the best baby shower menu of all time. Overall, the baby shower was just perfect. Everyone enjoyed their time celebrating Katie, eating delicious food + drink and sharing "mommy advice". Guests oooooed and ahhhhhed over the bacon jam, and the cinnamon buns. My husband said the egg boats were his fave. The homemade pumpkin spiced lattes were fabulous and it was just the most lovely day. 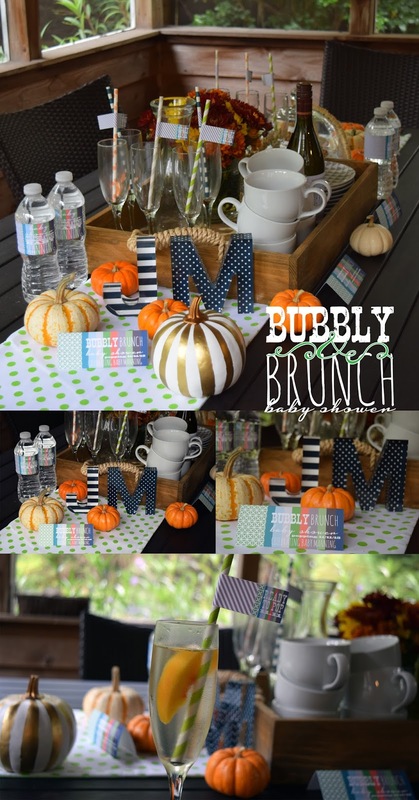 I purchased the cute acrylic letters + wooden tray from Home Goods, the gold pumpkins from Target and all the party related items may be found at Party Box Design. My 7 year old daughter strung cheerios onto a string to add a little fun to the table, cute fun idea for sure. 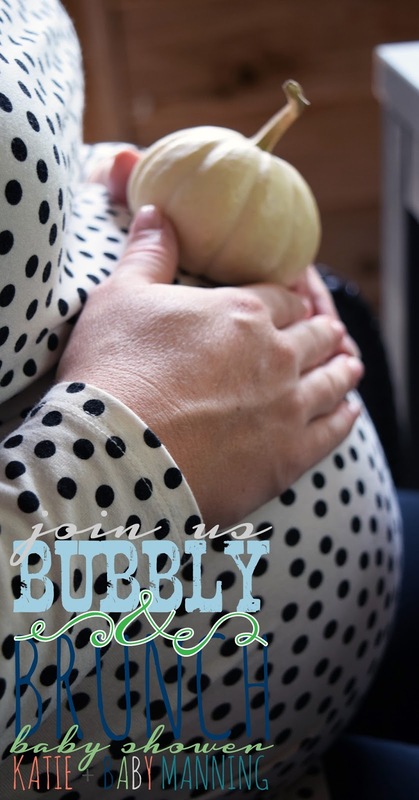 Hope this baby shower blog post helps y'all plan your own showers!